There are no longer any cruises from Cape Town to Mossel Bay. Options from Cape Town are to nowhere, Walvis Bay, Durban or Southampton. Click here to book. Those looking for a short cruise, but who are not keen on a cruise to nowhere, may be interested in a cruise from Cape Town to Mossel Bay. As you know, only one cruise ship is coming to South Africa for the 2017/2018 season. Book your cruise to Mossel Bay via SouthAfrica.TO & you qualify to earn travel vouchers - simply email a writeup and a photograph of your cruise to cruises@southafrica.to and we'll send you travel vouchers. Want to read a first hand experience? Since you'll be in Mossel Bay for a full day, it's worth checking out what else there is to do besides chilling on the beach. Do remember that it's a weather-permitted port of call, so do your research, but don't pre-book if you can help it, as you don't want to be disappointed. Nevertheless, here are the options! 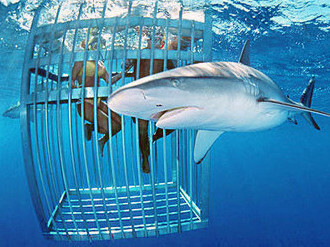 For the adventurous and adrenaline seekers amongst you, there are various companies offering shark cage diving. For some you don't need to pre-book, there might be afternoon trips you can take part in. Trips are around 2-4 hours long and you can expect to pay around R 1 350 for an adult and R650 for a child. A breakfast, light lunch, snacks and refreshments on the boat, diving and viewing, wetsuites & dive equipment supplied (available all sizes), afternoon tea upon arrival and of course the certificate of your White Shark Experiencewas included with the company I enquired with. There is an option to get the DVD of your adventures (around R350) and there are disposable waterproof cameras on sale as well. 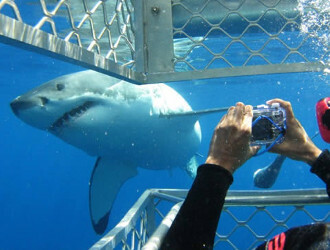 You can try White Shark Africa for more information or to make a booking. 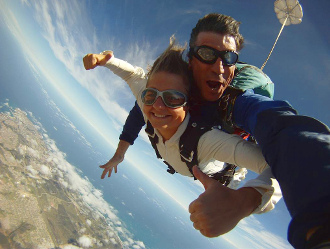 Mossel bay and the view over the Garden Route is on of the top spots in South Africa to so some sky diving. You can expect to pay around R 2000 pp for a 10 000ft Tandem Skydive. (R4000 extra for the video, photos & certificate), R 2 900 to do a beach landing and a 12 000 ft dive would cost around R 2600 pp. 1. Guided Game Drive (3 hours in the morning/afternoon)	Start at R395 per adult, R198 per child. There are also spa treatments available. For guests that stay at the premises, there is an option for fishing, canoeing, tennis courts and a river cruise. On a sunny Cape Town morning we arrived at E-Berth in the harbour to enjoy our "priority boarding" onto the MSC Sinfonia cruise ship (the 10th December 2012), for our cruise to Mossel Bay. This is our 3rd time on her and we now have 3 children in tow (2 months, 2 years and 5 years). Our previous Sinfonia cruises have been from Durban to Portuguese Island and Maputo. The joys of having babies aren't confined to the making of them! Although there is no official "priority boarding" in Cape Town, we jumped most of the queues at check-in, thanks to having an infant with us :) We've played this same game in Europe, where airlines generally let parents with infants board first. The first queue was at a warehouse at E-Berth in Cape Town Harbour, and we watched the cameras come out as pax got their first good view of the Sinfonia. The 2nd queue was formed to get on the ship. This may not be the most attractive spot in the world to queue, but is FAR better than the Eastern Mole which was used in the 2010 season. And things are only going to improve more, as Transnet plans to built a proper terminal here - this can only be good for tourism in the Western Cape. The 3rd queue was in the theatre where we got our cruises cards & emergency drill cards. There were the usual oohs and ahhs from the Italian crew on seeing our little infant. On checking in it immediately became apparent that there is far more of a focus on the emergency drills than in previous years. This was the first time that we've been issued an emergency drill card, which was handed in at the emergency drill to make sure that we had in fact been there. The Sinfonia gently moves away from its moorings with the unbeatable view of Table Mountain in the background. God happily planned Table Mountain and Cape Town to be north-facing from the harbour, allowing the sun to be behind us as we took our photos :) It's easy to just keep snapping & snapping away at this beautiful view. As you leave Table Bay have a look in the opposite direction of Table Mountain as well, to Robben Island, where many a political prisoner was kept during South Africa's dark days of apartheid. If you don't focus your mind you'll never build up a mental map of where things are - I've spent many cruises wandering about half-lost. The starting point I use in building up a mind-map is identifying which side of the ship my cabin is on if I'm facing the front of the ship (left/port or right/starboard). Also, is my cabin more to the front or back of the ship. Then when wandering the ship to relate other areas in a similar way (port/startboard and front/back) and think about them relative to my cabin. If you've got kids under the age of 3 you're going to have to look after them most all of the time yourself. There are very restricted times when you can take them into the Pinnochio Club (kiddies club) with you, but you'll still have to be there and look after them yourself. There were a bunch of channels, including 2 movie channels. One of the channels showed reruns of The Brave. The other showed Snow White, Battleship, People Like Us, Monsoon Wedding, Rock of Ages, The Pirates Band of Misfits, Think Like a Man, The Amazing Spiderman, The Odd Life of Timothy Green, Knock Out & Men in Black 3. 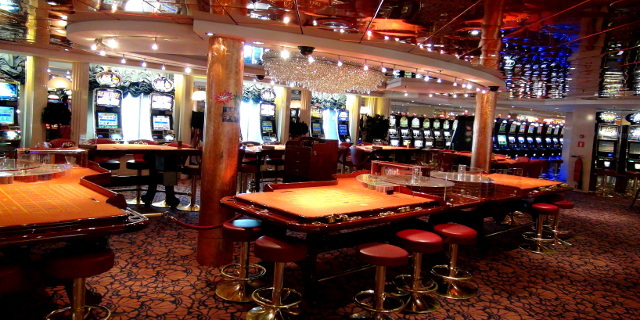 The disco on the 12th floor has been redesigned since we last cruised on the Sinfonia. There was new furniture, and part of it had been changed into a table tennis area, which was very popular amongst the kids. There are 2 pools on the 11th floor of the Sinfonia, each divided into a shallow section (about ankle depth for an adult) and a deep area (an adult is underwater) by a net. In between the 2 pools is a raised area with 2 jacuzzis on it. Around the pools are a couple of rows of deck chairs. The ones set further back get a bit more shade. On the 12th floor, above the pools are quite a few deck chairs which get the most sun. There are 2 times you should do your utmost to be on deck - the first is when you cruise out of Table Bay Harbour and the second is when you cruise back in! 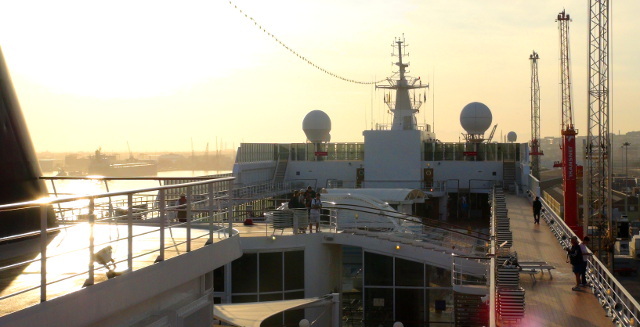 The sailaway party rocks & the cruise back into Cape Town is quiet and beautiful. On the last morning we cruised back into Cape Town. I woke up a bit late and started filming immediately I got onto the top deck! Here 20 minutes of footage of her cruising into Table Bay Harbour. See the Cape Town stadium, the harbour mouth, Devil's Peak, Table Mountain, Lion's Head, Signal Hill, the sun rising, the V&A Waterfront and other early birds on the deck of the Sinfonia. Last photo, before disembarking, of the Sinfonia being bathed in morning sunlight in Cape Town. 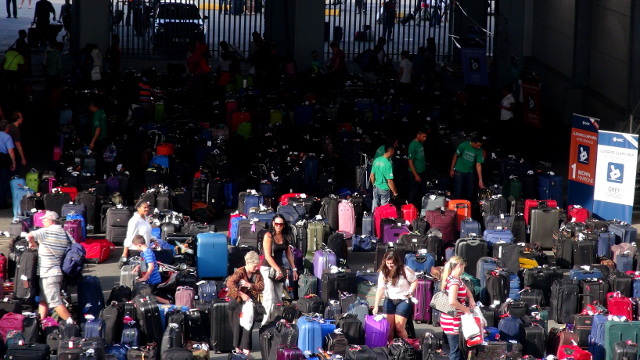 And then after disembarking the next task is to find your luggage at Table Bay Harbour's E-Berth.